Access and discover the main parts of the Retiro Park with an expert guide. This tour will offer you a detailed tour of the park with an expert professional guide. El Retiro is the main park in the city of Madrid, a favorite place for both locals and visitors. There you can walk, run, visit historical monuments, see exhibitions, relax with friends or simply enjoy a lunch. 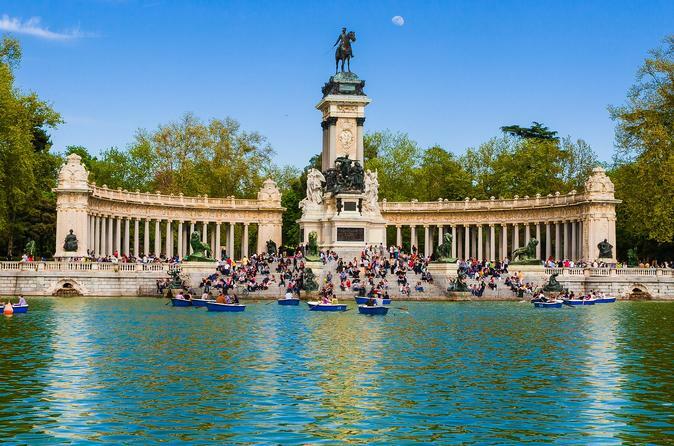 El Retiro has more than 19,000 trees of 167 different species, a lake and a variety of different sculptures, important buildings and gardens that make the park one of the most famous parks in the world and one of the main attractions of Madrid. On this tour, your guide will take you on a route through El Retiro's most famous sites such as the Crystal Palace, the Philip IV Gate and the Royal Observatory, as well as some places that are not listed in the guides.